The 12 Days Kenya Safari will take you to 8 unique National Parks which include Amboseli National Park, Aberdare National Park, Samburu National Reserve, Mount Kenya National Park, Lake Baringo, Lake Bogoria, Lake Nakuru and Masai Mara Game Reserve. 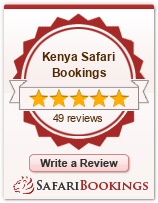 Below is the 12 Days Kenya Safari itinerary. We depart Nairobi City in the morning and drive south through Masai country to the plains below Mount Kilimanjaro where Amboseli is situated. After a stopover lunch at Sopa lodge we proceed into the scenic Amboseli National Park for a game drive returning to the lodge in the evening for a sun downer. The waters from melted snow drain down Mt. Kilimanjaro under lava flows and surface in Amboseli, creating a green belt of swampland amidst dusty plains. Here buffaloes, lions, gazelles, cheetahs, wildebeest, hyenas, jackals, warthogs, Masai Giraffes, zebra, baboon, hippos and waterbuck can be seen against the backdrop of the magnificent snow-capped mountain. After a leisurely breakfast, we explore the park through morning and afternoon game drives. We have sufficient time for relaxation at the lodge, complete with the majestic Mount Kilimanjaro in the background. At 329 sq km Amboseli is a small park and lacks the profusion of animal species found in the Mara, but the landscape provides limited cover so we have better chances of seeing some of the larger predators. We leave Amboseli, viewing game as we drive via Nairobi to the Aberdare to enjoy the experience of staying in a Tree Hotel or lodge overlooking floodlit waterholes where wildlife and birds regularly visit. Dinner and a well deserved sleep thereafter. Over 40 species of wildlife inhabit the Aberdares mountain ranges, hiding in the heavily forested slopes and in the upper moor lands. Aberdares National Park is noted as a rhino sanctuary but keep an eye out for the elusive rare bongo which is best spotted in the upper bamboo zone and hypericum scrub. After breakfast we proceed further north across the Equator to the edge of the Northern Frontier. We arrival in time for lunch and have an afternoon game drive returning in time for a sun downer and dinner at the lodge. The whole day will be spent relaxing and leisurely exploring the Samburu National Reserve in the morning and afternoon game drives. You may opt to do some of the activities offered at the lodges for a small extra cost. We enjoy a final early morning game drive in Samburu National Reserve and then we depart for Mount Kenya National Park. We arrival at the lodge in time for you to enjoy the facilities of the lodge or take an optional tour to the nearby Sweetwaters Reserve which is home to Chimpanzees. Morning drive via the Nyahururu Falls down to the shallow soda Lake Bogoria and later to the beautiful Lake Baringo where you may enjoy the pleasure of an evening bird walk. Dinner and overnight stay at the lodge. We enjoy a morning boat ride in search of hippo, crocodile, and fish eagle. After a sumptuous lunch, we then proceed to Lake Nakuru National Park for an afternoon game drive. After an early breakfast we depart for Masai Mara Game Reserve via the Great Rift Valley arriving in time for lunch at the lodge. We then proceed on an afternoon game drive returning to the lodge for a delicious sun downer then we have dinner at the lodge or luxury tented camp. The next two days shall be spent enjoying game viewing drives in the early morning hours and in the evenings as this is when we have the best chances of seeing wildlife. The ultimate action here is without doubt the annual wildebeest exodus in July and August when millions of these grass eaters move north from the Serengeti in search of lusher grass before turning south again in October. After a final early morning game drive we depart for Nairobi City arriving in the afternoon hours. We then drop you at your hotel or drive you to the airport for you flight back home.